I seldom get to photograph weddings for friends any more since many of them are already married, so when Mark contacted me about photographing his wedding, it was exciting news, not just because of the wedding, but I knew what a fun and cool guy Mark is, so I had big expectations for a fun and relaxed wedding with him and his fiancee (now wife) Mary. 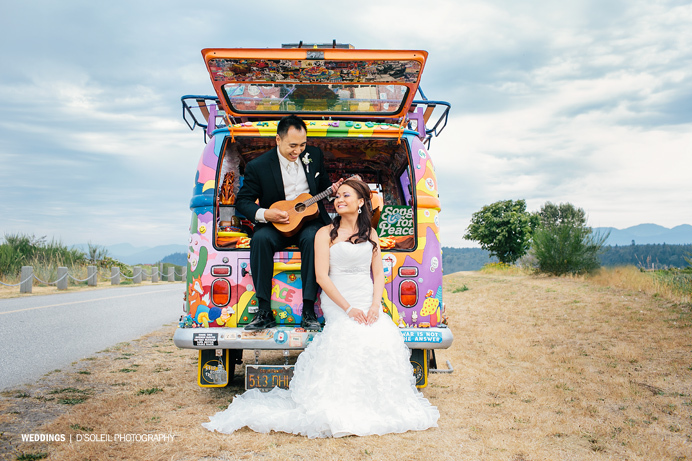 While driving around on the wedding day, we discovered a Hippie Bus, and I knew then that I had to create something with Mark and Mary that featured it. We took a handful of photos with the bus that I’ll looking forward to showing later, but for now, here’s one of my favourites. Next Post Lucky in Love: Fairmont Pacific Rim | Jason + Jane Vol 1.